Doubles and walks ... sort of like Olerud at shortstop? 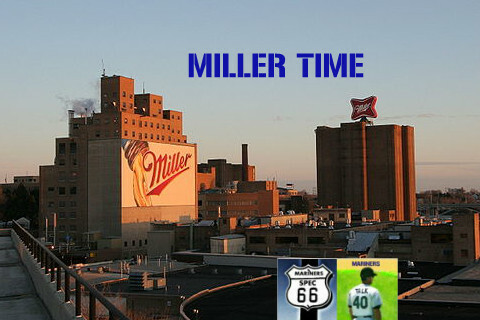 Cheesy MarinersTalk.com catchphrase: Miller Time! I had been focused on Miller being from Clemson, so I didn't realize that he and Franklin are both from the Orlando area, and their high schools are only about 20 miles away from each other. Miller graduated from Olympia High School in Orlando in 2008 and Franklin from Lake Brantley High School in Altamonte Springs in 2009. I don't know if they ever faced each other as youth the way Ackley and Seager did, but it would seem likely. There is also a Brad Miller who played in the NBA (a 7-footer), another who played in the NHL, another who was a congressman from North Carolina, and yet another who was an Australian Rules Footballer. Am I getting on the Gordon Gross bandwagon? Of course! Why wouldn't I? But actually, I forecast all my "controversial" rankings back in November: Miller over Franklin; Catricala over Romero; Ard over Kivlehan. And I stuck with them, but this is probably the only one that Gordon will sign on to. Olerud's career ISO was exactly .170, and Miller could approximate that if he hits enough doubles. Now, there's no assurance that he will, but even if he doesn't, he'll have plenty of stick if he can play shortstop every day, and the organization seems to think he can. They apparently loved what he did in the Cactus League (.810 OPS with 4 doubles, 2 triples and a homer), and held onto him until the last day. Oh ... did we mention the 23 steals? Ole only had 24 attempts in his entire career.